Today Aurora reminded us of another home feature we used to have but which proved incompatible with puppies: a sprinkler system. 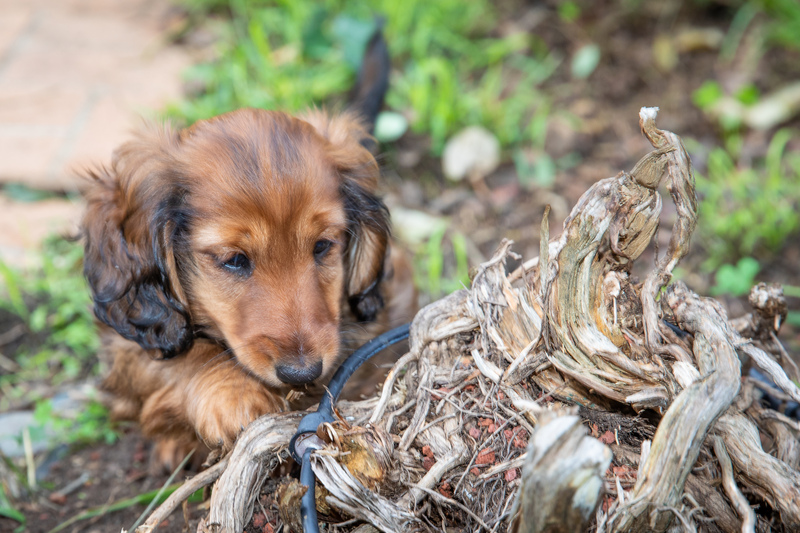 Aurora has consistently (so far) focused on chewing plants and their roots. She’s left the plastic bits of sprinklers alone. However, this picture reminds us that previous puppies chewed enough parts to make the system leaking and unreliable. For a while — a few years, actually — we dutifully replaced the tubes and connectors gnawed by our beasts. But, we’ve stopped. I’d like to say we stopped because we became more water conscious during the drought years. And, there’s some truth to that. Plus, our newer plants and bushes didn’t line up with the existing irrigation lines. But, the stop-stopping reason for no longer turning on the water is canine behavior!